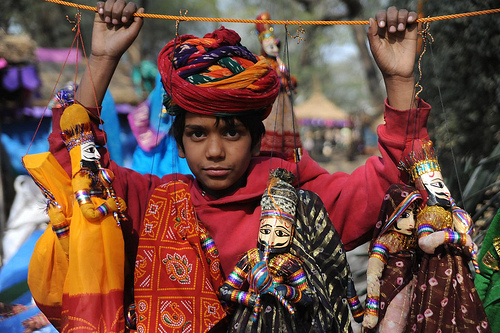 If you have not visited the ongoing Surajkund Crafts Mela yet, you still have two days to go. Three, if you count today as well. The Surajkund Fair is organised every year by the Haryana Tourism to showcase the cultural diversity of the country. You get to sample the art and craft of different regions. The Surajkund Fair showcases the finest handicrafts, and handlooms besides presenting the flavours of India from different states at one venue. It is a perfect occasion to understand and overwhelmed by the rich cultural heritage of India. In the 26th edition of Surajkund Fair, Assam is the theme state. You can see the craftsmen and artists from Assam showcasing the cultural diversity of the state. Besides artists and craftsmen within the country, the craftsmen from SAARC Nations also participate in the Surajkund Fair. Surajkund is close to 10 km from South Delhi. Regular buses are available from ISBT Kashmere Gate, Shivaji Stadium (in Connaught Place), Gurgaon and Faridabad. If you are planning to reach Surajkund Mela by own car, you can park your vehicle at the following parking areas. Click here for more such lovely pictures of Surajkund Fair 2012.